This morning Facebook memories served me this from poet and writer David Whyte, whose work I have found periodically both infuriating and helpful. It is less an accurate description of pain and more and exploration of the impact on pain on one’s life and mind. I do not agree with all of it, but pain is an impossibly personal experience. Those in pain may see themselves in some of it; I hope that those without pain may find an opportunity to understand. Through the radical undoing and debilitation of repeated pain we are reacquainted with the essentialities of place and time and existence itself; in deep pain we have energy only for what we can do wholeheartedly and then, only within a narrow range of motion, metaphorically or physically, from tying our shoe-lace to holding the essential core conversations that are reciprocal and reinforcing within the close-in circle of those we love. Pain teaches us a fine economy, in movement, in the heart’s affections, in what we ask of our selves and eventually in what we ask in others. Pain’s beautiful humiliations make us naturally humble and force us to put aside the guise of pretense. In real pain we have no other choice but to learn to ask for help and on a daily basis. Pain tells us we belong and cannot live forever alone or in isolation. Pain makes us understand reciprocation. In real pain we often have nothing to give back other than our own gratitude, a smile that perhaps looks half like a grimace or the passing friendship of the thankful moment to a helpful stranger, and pain can be an introduction to real friendship, it tests those friends we think we already have but also introduces us to those who newly and surprisingly come to our aid. 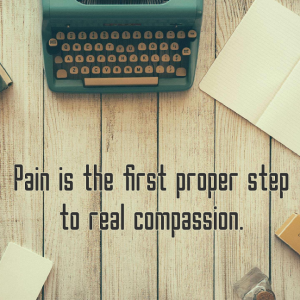 Pain is the first proper step to real compassion; it can be a foundation for understanding all those who struggle with their existence. Experiencing real pain ourselves, our moral superiority comes to an end; we stop urging others to get with the program, to get their act together or to sharpen up, and start to look for the particular form of debilitation, visible or invisible that every person struggles to overcome. In pain, we suddenly find our understanding and compassion engaged as to why others may find it hard to fully participate. Strangely, the narrow focus that is the central difficult invitation of bodily pain, calls for a greater perspective, for a bigger, more generous sense of humor. With the grand perspective real pain is never far from real laughter – at our self or for another watching that self –laughter at the predicament or the physical absurdity that has become a daily experience. Pain makes drama of an everyday life with our body and our presence firmly caught on stage and in the spotlight, we are visible to others in a way over which we have no choice, limping here or leaning there. Lastly, pain is appreciation; for most of all the simple possibility and gift of a pain free life- all the rest is a bonus. Others do not know the gift in simply being healthy, of being unconsciously free to move or walk or run. Pain is a lonely road, no one can know the measure of our particular agonies, but through pain we have the possibility, just the possibility, of coming to know others as we have, with so much difficulty, come to know ourselves. ‘PAIN’ From CONSOLATIONS: The Solace, Nourishment and Underlying Meaning of Everyday Words. © David Whyte. 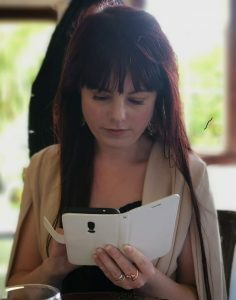 This entry was posted in About illness, Writing and books and tagged chronic illness, David whyte, pain by writehanded. Bookmark the permalink.